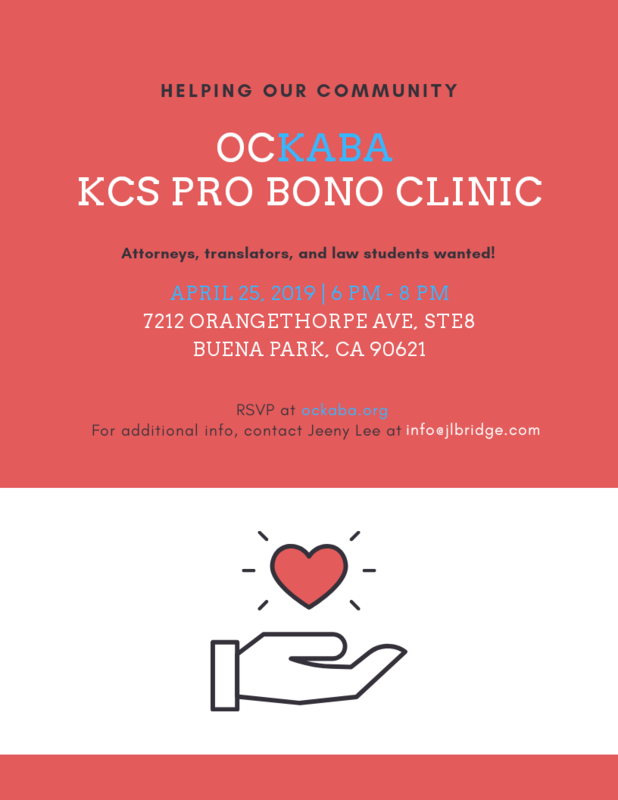 Please join us at our upcoming pro bono clinic on April 25th at the Korean Community Services (7212 Orangethorpe Ave., Suite 9A, Buena Park, CA 90621, Tel: 714-503-6550). We have 10 clients already signed up and in need of your help! We are looking for attorneys, law students, and Korean-speaking interpreters. It's a great opportunity to meet local legal professionals and gain firsthand experience in a diverse range of legal areas -- including family law, immigration, personal injury, social security, employment, real estate, and etc. Bring your attorney friends and colleagues! For additional information or any questions, contact Jeeny Lee at info@jlbridge.com.